On launch day, final preparations began with the countdown clock at 13 hours before lift-off (or T minus 13 hours in the parlance of the rocket men at KSC) when the lower of the S-IC's two massive tanks was filled with refined kerosene (RP-1) propellant. 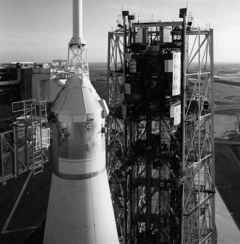 Whereas the rest of the Saturn's propellant tanks carried volatile and super-cold hydrogen and oxygen that had to be loaded during the final hours before lift-off, the RP-1 could remain in its tank for extended periods. Next, the Saturn's cryogenic tanks were prepared to accept their loads. Both hydrogen and oxygen are gaseous at normal pressures and temperatures. To use them in a large rocket, their quantities had to be concentrated within their tanks and there are only two ways to achieve that. Either they are stored under very high pressure, which would have made their tanks hopelessly heavy to achieve the required strength, or their temperature is lowered sufficiently to liquefy them. To be used in the Saturn V, oxygen needed to be at minus 183°C, becoming liquid oxygen (hereinafter referred to as LOX), while the very light hydrogen fuel had to be chilled to minus 253°C, only 20 degrees above absolute zero. Use of these cryogenic propellants in any rocket demands elaborate insulation but the effort is worth the benefit as liquid hydrogen is a very high-energy fuel. In particular, the tanks had to be carefully conditioned before the contents could be loaded. This required removal of every trace of water vapour from the tanks and, in the case of the hydrogen tanks, even air had to be purged to prevent the nitrogen in it from freezing and contaminating the fuel. To achieve this, increasingly cold helium gas was pumped through the tanks of the upper two stages, while dry nitrogen cleared out the S-IC's LOX tank. Once the tanks had been purged of contaminants, the propellants could be loaded, but even that had to be carefully handled because, compared to the liquids they would receive, the walls of the cryogenic tanks were hot and the propellants boiled furiously when they were first introduced. It was similar to pouring water into a saucepan that has been sitting on a flame for too long. To begin with, propellant was pumped in slowly and allowed to boil, removing heat as it did so and further chilling the tank. Eventually a pool of liquid settled at the bottom of the tank, at which point the ground crew began to pump in propellant at the maximum rate. When the tanks were nearly full, a slow fill rate was resumed to fill them completely and compensate for the ongoing boil-off, caused by the ambient Florida heat that was leaking into the tank. This state was maintained until a few minutes before launch when the venting valves were shut and the pressures inside the tanks were allowed to build to their operating values. 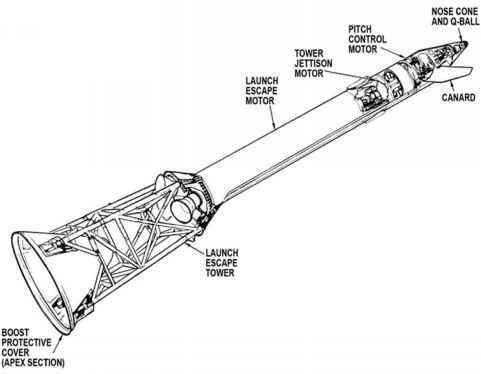 The Apollo 8 CSM as the MSS was withdrawn.